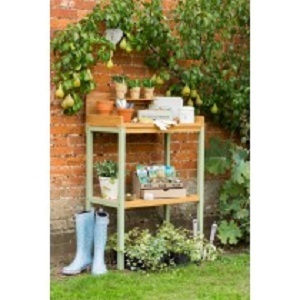 Have a browse of our stylish range of garden shelving, pot stands and planting tables. We have beautiful wooden shelves and tables from Norfolk Leisure’s Verdi and Gregio ranges. They are perfect and practical accessories for your greenhouse and garden, with storage space for all your potting needs. Also, our antique black stands from Poppyforge, made and designed in Britain, make for a unique and picturesque display of your potted flowers and homegrown delights. In addition to these, we have Zest 4 Leisure’s best selling, pressure treated potting table, the perfect place to plant your seedlings. Our various potting stations, benches, tables and shelves are the ideal way for you to display your potted plants.